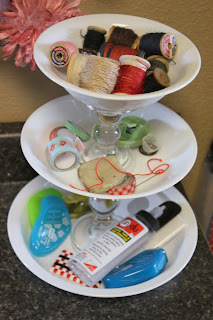 So, I am guessing you know about the website, Pinterest. 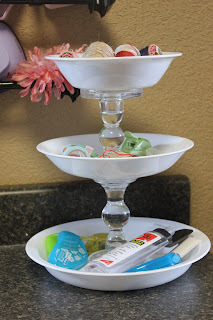 I love pinning...I could spend the whole day pinning goodies I have found on the web! Very addicting, that website is! 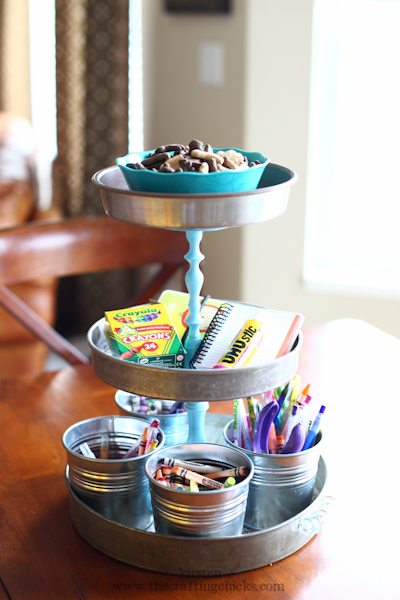 On day, while playing around on Pinterest, I saw this amazing homemade 3-tiered tray/organizer. Lovely, huh? There is a how-to, found here. ﻿Well, me being me, decided to make my own, using what I had (or what I could find cheap). After some searching, I headed to Walmart with a goal of recreating this lovely organizer, for less than 10 bucks. What do you think? I like them. Not too big, not too small. I used Gorilla glue to glue them together...works like a charm. That's all for today :) We are leaving early this morning for Six Flags....should be fun. And hot. And more fun :) Hopefully I will have lots of photos to share when I get home!